A new housing estate in Louth, Lincolnshire installed 5 EvacSill concealed fire escape ladders. The estate was built with timber-framed, two- storey houses, aimed mainly at families. To allow quick and safe escape from the upper floors, EvacSill ladders were installed. Developed and manufactured by Safelincs, these fire escape ladder systems are fitted hidden in the inner wall of a house. 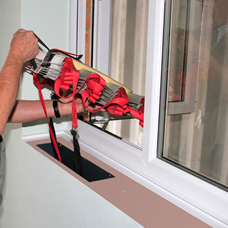 In an emergency, the window sill is pulled out and the ladder is deployed. EvacSill escape ladders are available for timber-framed as well as brick-built houses. While they are mainly aimed at new-build homes, they can also be retro-fitted. The EvacSill ladders are always accessible, can never be mis-laid or lost and offer a rapid escape. Ismena Clout of the BIFM recently endorsed Safelincs’ offering of P50 maintenance-free fire extinguishers . P50s do not require any maintenance or service for ten years, saving FM companies substantial amounts of money. “Sometimes a new product comes along that you know is going to alter the market, I believe that the P50 fire extinguisher from Safelincs is just such a product. It saves clients and FM companies money and ongoing maintenance headaches; it really is a game-changing product.” said Ismena Clout. The BIFM is the professional body for facilities management in the UK. The Institute delivers a range of services and benefits, including information, qualifications, continuing professional development, training and networking for over 13,000 individual and corporate members. 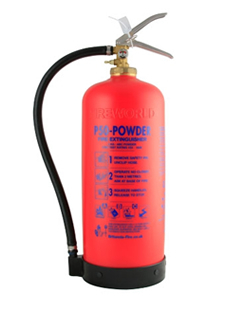 P50 maintenance-free extinguishers (also known as Fireworld extinguishers) are manufactured by Britannia in Norfolk and are distributed and installed by Safelincs. We carry out the initial site survey and install the P50 extinguishers. Our BAFE certified engineers then train the customer or their FM provider in the visual annual check required, issue training certificates and the official extinguisher certification. Safelincs offers a refill service for any extinguishers emptied and, as a special service to our customers, replaces any extinguishers used to fight a fire for free. The P50s come with a ten year warranty and at the end of the ten years, Safelincs offers a full factory refurbishment to increase the lifespan by another ten years! In an age where new cars do not require servicing for tens of thousands of miles despite demanding usage, it was always a bit of an anachronism that fire extinguishers, which usually see no action or use for their entire life, were required to be serviced every year and to be refilled after five years. Finally, the fire safety industry has come up with a solution – P50 maintenance-free fire extinguishers. These extinguishers, once installed by our certified engineers, do not require an extinguisher service engineer to visit again for ten years, saving the customer substantial amounts of money! 2) What are maintenance-free extinguishers? Most fire extinguishers contain a cocktail of aggressive chemicals which can quickly corrode metals. The traditional way of preventing this corrosion from damaging an extinguisher is to line extinguishers with molten plastic. This process always had its limitations as the lining can become detached from the wall, become porous or can be incomplete in the first place. As a result yearly inspections have been necessary. P50 Maintenance-free extinguishers, on the other hand, contain the chemicals within a three-layered extruded composite plastic container. As these extinguishers, after being installed by our certified engineers, will only be visually inspected by our clients, the P50 extinguishers must have additional security features to ensure that, for example, the pressure indicator displays the status of the extinguisher correctly. This is achieved with duplicate pressure indicators. In addition one of these pressure indicators is magnetic so that the free movement of the needle can be checked with a magnet provided if in doubt. Does the customer need to do anything? Maintenance-free extinguishers must still be visually inspected by the customer or their representative as any other extinguishers, and once a year, the extinguisher’s age must be checked, the hose be looked into to spot any obstructions and the pressure indicator read to ensure it is in the green zone. If everything is ok, the back of the extinguisher is filled in with a marker pen and the finding logged in the fire safety logbook (the same as with any other extinguisher). If a problem is found, Safelincs simply replaces the extinguisher for free. 4) How are they made? The main component of the P50 extinguisher is the inner composite plastic container holding the chemicals. This container is cocooned by Aramid fibre (which is the material bullet proof vests are made of). This tightly spun weave takes up the pressure from the filled extinguisher. To protect the Aramid from UV light, water and wear, the cocoon is covered by an outer cylinder made of UV protected rugged plastic. P50 extinguishers are made in the UK. 5) How durable are these extinguishers? P50 are tested not only to the EN3 extinguisher standard, which is a demanding standard. In addition they are also tested to the PED (Pressure Equipment Directive), the same standard that containers with pressurised explosive gas are tested to. The extinguishers are pressured 12000 times from zero to 25 bar. They are then crushed by a metal blade and re-pressurised to over 55 bar without bursting or leaking. In actual fact they only burst at around 85 bar during this test. P50 extinguishers are kitemarked by the British Standards Institute to EN3 and in addition certified by Apragaz. They are approved for marine use (MED approval) and boat use (Boat Safety Scheme) as well. Most major insurances have explicitly approved the P50 extinguishers, as long as they are installed by certified engineers. When the extinguishers are purchased, Safelincs’ certified engineers visit the customer, carry out a free site survey, the free install, free commissioning and certification and train the customer in the visual inspection mentioned above. We also always suggest that the customers notify their insurer about the modified extinguisher regime. To this end our engineer will hand the customer a letter to be sent to their insurance. 8) Where can these extinguishers be used? The P50 foam extinguishers replace traditional foam, water and CO2 extinguishers in office environments, schools, nursing homes, animal husbandry and similar environments. The P50 powder extinguishers are used in engine rooms, refineries, farms and other challenging outdoor locations. 9) What happens after ten years? After ten years Safelincs offers a refurbishment at half the price of a new P50 which gives the extinguishers another ten year lifespan. 10) Where can you buy P50 extinguishers? To purchase P50 extinguishers in the UK, contact Safelincs on 0800 612 6537 or visit www.safelincs.co.uk. You can place an order and we will contact you to agree a date for the free installation and certification or you can ask for a free site survey before committing to a purchase. Financing options are also available to help spread the cost of the extinguishers. 11) How can the FM industry benefit? P50 extinguishers are often offered by FM companies to their customers as part of their overall service package, as many large customers do not want to be involved at all in the fire extinguisher provision, maintenance-free or not. In these cases the FM companies simply request the P50 extinguisher provision from Safelincs whose certified engineers will carry out a free site survey to determine which extinguishers are required and where. Safelincs will then immediately carry out the free install, free commissioning and certification and the free training/instruction to whoever will look after the P50s. Safelincs then hands responsibility for the yearly visual inspection to the FM company. The FM company does not require any tools, specialist training, certification or refresher course for this visual inspection. 12) Can the P50 be phased-in? If a customer has existing extinguisher provision where extinguishers do not expire all at the same time, we offer a staged introduction to make this process easier and most cost efficient. 13) Who has installed the P50 already? Early indications are that the deaths of a 36 year old woman and her 10 year old daughter in a boat on Lake Windermere over Easter will be attributed to carbon monoxide. Carbon monoxide build-up in boats is often overlooked, however, with the temperatures as cold as they have been over the last few weeks, many boat owners had to heat their cabins with heating appliances that have not been used for a long time and might not have been serviced for a while. In recent years, escaped flue gases from solid fuel stoves or generator exhaust gases have been responsible for most deaths of boaters from CO poisoning. 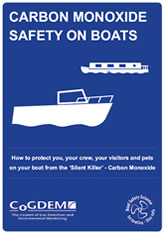 To raise awareness about carbon monoxide on boats we worked with the Boat Safety Scheme and CoGDEM (The Council of Gas Detection and Carbon Monoxide Monitoring) to produce the booklet ‘Carbon Monoxide Safety on Boats’.